Give the gift of Grimaldi's Pizzeria. 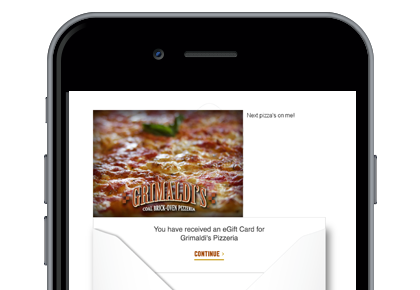 Your recipient receives a beautiful, full-color, personalized eGift Card that can be redeemed at participating Grimaldi’s Pizzeria locations in AZ, CA, CO, FL, ID, KS, KY, NV, SC, TX, and WI. Not valid in NJ, CT or NY except for 1 Front St, Brooklyn, NY. 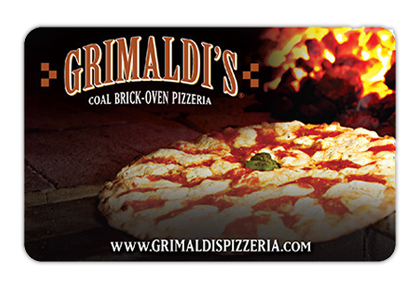 Gift Cards can be redeemed at participating Grimaldi’s Pizzeria locations in AZ, CA, CO, FL, ID, KS, KY, NV, SC, TX, and WI. Not valid in NJ, CT or NY except for 1 Front St, Brooklyn, NY.